Merchant Marine Flags - Made In The USA! Design: A blue flag with an eagle perched on top of a red, white, and blue shield with an anchor in the middle. At the top of the flag there is the text "In Peace and War" and at the bottom there is the date "1775". Use Today: Used to commemorate merchant of the past and present who contribute to the safety and prosperity of the United States of America. It is used in ceremonies like parades, and currently is displayed at the U.S. Navy Memorial in Washington, D.C. The U.S. Merchant Marine is made up of American civilian-owned merchant ships and the people that crew them. The Merchant Marine transports cargo and passengers during times of peace. In times of war, the Merchant Marine supplements the U.S. Navy and helps deliver troops and supplies for the American Military. The Merchant Marine was officially created with the passing of The Merchant Marine Act on June 29th, 1936, but their services to the United States date all the way back to the Revolutionary War. Two years later, Joseph P. Kenney (the father of President John F. Kennedy) founded the U.S. Merchant Marine Corps. This would ensure that Marine Merchant Seamen would have more official training than ever before. When the United States entered into WWII, there was an immediate necessity for the Merchant Marine to grow. Desperate for seamen, the U.S. Maritime Service accepted mariners as young as 16. While there had been around 55,000 mariners before the onset of WWII, their numbers increased to 215,000 after their immense recruiting efforts. A total of 733 American cargo ships were lost to enemy action during WWII, and over 6,000 civilian American seafarers lost their lives to enemy action. The Merchant Marine has continued to contribute to the "security and prosperity" of the U.S. throughout its service to the nation, and as of 2009 the U.S. merchant fleet numbered 422 ships and about 69,000 mariners. On May 24th, 1994, Albert J. Herberger (The Maritime Administrator) premiered a flag meant to honor the civilian mariners who have supported American armed forces in times of war and contributed to the nation's prosperity through commerce in times of peace. The flag was first revealed at the annual U.S. Merchant Marine Memorial Service in Washington, D.C., and event that honors the thousands of civilian seafarers killed in war. At the memorial service Herberger said, "America's Merchant Marine and civilian seafarers have put themselves at risk to support our armed forces throughout our history. It is most appropriate that this symbol of America's appreciation to American Merchant Mariners be presented today." The flag's design consisted of a blue flag with golden fringe and a design including an eagle, a shield, and an anchor. The American Eagle, U.S. shield, and anchor were meant to symbolize the Merchant Marine's loyalty and service to the U.S. 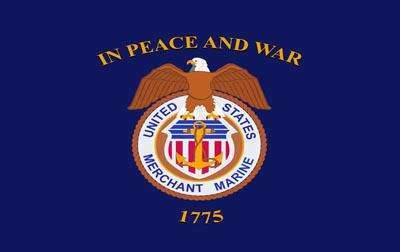 Above the eagle is the text "In Peace and War", and at the bottom of the flag is the year 1775, to honor early Merchant Marine contributions to the United States.